I don’t know about you, but when I think of Fall fashion my mind immediately goes to chunky sweaters. I love looking stylish and feeling comfortable, and sweaters give you the best of both worlds! Chunky sweaters are definitely a staple in my Fall wardrobe because they look great with so many things. In today’s post, I’m showing you two of my favorite chunky sweaters that I’m going to be wearing all season. These sweaters are perfect for cozying up while still looking chic on chilly Fall days. Lately it’s been pretty chilly in the office because we blast our AC, LA just won’t give up on the heat! This sweater from Revolve has been my favorite to throw on over any outfit at work when I get cold. It’s seriously so soft and comfortable! This sweater really keeps you warm and I love how fun and bright the colors are, it’s such a fun statement for Fall! It looks great paired with a simple pair of jeans or even a denim skirt. I know Revolve’s sweaters can get a little pricey but the quality is simply amazing. I think it’s definitely worth the money, but you can easily get the same look under a hundred dollars. I’ve linked an affordable alternative to this sweater and all of my outfit details for you below! This chunky sweater is probably one of the softest I’ve ever owned, the cashmere material is so cozy! I love how it’s a little oversized and easy to dress up or down. 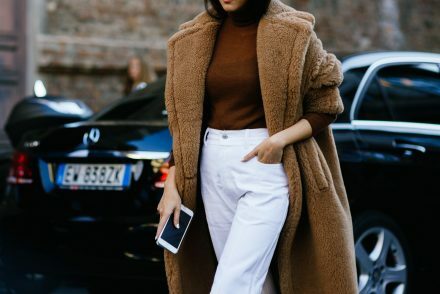 Throw on a sweater like this with a pair of black booties and a belt, and you’ve got yourself a chic and comfortable Fall look. I love long sweaters like this one, because they’re so versatile. Wearing them over leggings or as dresses paired with over the knee boots is one of my favorite ways to wear them for Fall. I hope you guys enjoyed today’s post on the most comfortable chunky sweaters for Fall! I’m definitely going to be wearing these two all season. (Even if LA won’t cool down!) Leave a comment sharing your favorite way to wear a chunky sweater! I absolutely love fall, not for the cold weather but for the sweaters! I love wrapping up warm with a nice pair of leggings and looking so chic at the same time ☺️ And if its short, I throw on a huge scarf or a snood ? Your sweaters look so cute, I loved the way you style them! I have more than enough to last me a lifetime but hey, lets get some more! ? Awee the Revolve sweater you showed on insta stories. I love the colors and the grey sweater dress is so cute. My favorite way to wear a chunky sweater is with some skinny faux leather leggings for a dressy look. Great post Sona. I never thought to add a belt with a sweater dress, it actually looks more fancy. Love the idea of pairing them with leather leggings! Im about to cry over the fact that Fall is finally hear!!! Love chunky knits! I remember when you got the Willough one, i fell in love!!! Any ideas as to what kind of necklace accesory can I add to a chunky sweater? I cant seem to pair them with anything!!! That would look so cute! I needed this so much right now!!!! I’m ready to live in some oversized sweaters! I’m going to be wearing them this entire season!! It’s definitely one of my go to looks, you’ll look so cute! Cashmere sweaters are my favorite! Living in Canada I feel like we skip fall sometimes haha I’ve already pulled out all my comfy sweaters. You look amazing! Definitely need to get a sweater dress like that one? Everyone needs a staple sweater dress for fall/winter! Loved that colourful sweater so much!! It’s a great sweater! I’m sure you’ll love it. Cozy sweaters are my favorite and go-to for fall! I absolutely LOVE chunky sweaters. I literally live in them when it does actually get cold in LA. They’re just so comfortable but still can be styled with anything. They are definitely a fall staple! But can you do a post sometime soon about good warm clothes for winter. I just moved from India to Chicago for my graduate school and I am freezing?? I’ve gone to a lot of stores and I’ve found warm but not very cute winter wear! And off course I want to look cute going to college everyday! That’s such a great idea! Thanks pretty. Good luck with college! I usually use ripped jeans and sweaters! LOVE fall! You look great in these pics! ???? Ripped jeans are so cute. Thanks babe! They’re the best, and so comfy! I love these sweaters! They look so comfy and comfortable. They are so cozy! Perfect for this time of year. I love wearing furry and turtle neck sweaters with jeans and some sneakers/pumps. Thanks babe! I love how versatile sweaters are, wearing them with tennis shoes or heels is so cute! The first one look so comfy !!!! I need it ring now !! lol. Really good taste and choices as always !!!! ?? It’s one of the most comfy sweaters I own for sure. Unfortunately we live in a dry/humid region and hardly experience any sweater seoson . I totally loved bright colored sweater that you’re wearing. I love your style. Fall is my favorite. love the collection you posted. Your blogs are my favorite. I absolutely love everything about fall but unfortunately it hasn’t quite reached us here in Lisbon yet. Can’t wait to use your tips as an excuse for some shopping ? It’s still so hot in LA…girl I feel you!